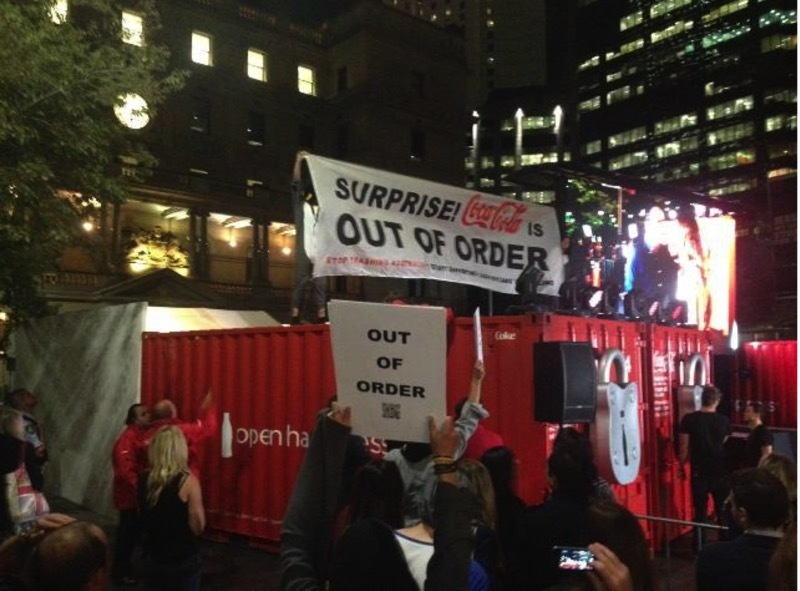 BREAKING: Out Of Order activists hi-jack Coca-Cola's Big Prize Surprise Promotion in Sydney dressed as penguins! This action was organized to address the harm done when Coca-Cola opposed container deposit legislation and sued to stop the legislation. When Coca-Cola released "Coming Together," a 2-minute ad addressing obesity, it was met with jeers and howls of laughter. Now that the laughter has died down, Center for Science in the Public Interest (CSPI) thought it would attempt to translate the ad's Cokespeak into plain English. "Ms. Butler faced racial and gender discrimination, unfair and dangerous work assignments and sexual harassment from supervisors and co-workers..."
"When I was young, I took it as the gospel truth that Coca-Cola could eat the paint off of cars. Then my grammar school classmates reported that baby teeth dissolved in Coke. I learned my lesson: Drink Coke at your own peril. "I divested my Coca-Cola stock some time ago for social responsibility reasons — Mark Bittman recounts the health dangers in his New York Timesblog — and for financial reasons..."
"Unless you are a Union member or a student of Union Activism, the name Ray Rogers may not ring a bell. However, if what he has to say about alleged racial discrimination, human rights and environmental abuses perpetrated by America's Iconic brand, Coca-Cola, you will think of his name every time you hear or see one of their ubiquitous commercials. "In today's '15 Minutes of Fact,' Ray Rogers will make some very serious allegations of racial discrimination in Coca-Cola bottling plants in the Greater New York City area along with his concerns regarding Coca-Cola's worldwide labor, human rights and environmental abuses. "Sounds like a tough slog...for both parties..."
Dare to Speak Up about Racial Discrimination? Coca-Cola: You're Fired! Before Yvette and Sandra were unjustly terminated from their jobs, they had three strikes against them: they are black; they are women, and they courageously spoke up against the abuses inflicted upon them while on the job in the Coca-Cola bottling plant in New York City. Queens, New York resident Sandra Walker was suspended, but found innocent of charges that she told a supervisor, "You're a dead man," after witnesses proved she told the supervisor, You're a racist." Yet Sandra was never reimbursed for five weeks lost pay. "I complained about recurring abuses. This led to me being interrogated by persons from Coke's Human Resources Dept. in Atlanta. I was asked such irrational questions as, 'Sandra, do you have any personal friends who are HIV Positive?' Then I was terminated." Brooklyn, New York resident Yvette Butler , in retaliation for speaking up, was unjustly fired from her job. "As a result, I lost my home and with three children had to move into a city homeless shelter for 13 months. I endured offensive racial comments and harassment on the job, as well as unfair and dangerous work assignments." Yvette still suffers from depression and anxiety from the mistreatment at the hands of supervisors, managers and co-workers. Read more about Yvette's and Sandra's cases and that of other victims of Coke's abuses. Try to understand the pain of being a victim of racial discrimination and the unfair treatment, nightmares, panic attacks, constant stress and emotional turmoil. "If a few candidates for the D.C. Council have their way, you'll have to run across the border into Maryland or across the river into Virginia to quench your giant soft drink thirst, according to a report by Washington City Paper. "At a Democratic debate for the at-large council seat Thursday evening, four of the seven candidates hoping to represent the city said they would support enacting a ban on large sodas, similar to the ban enacted by New York City Mayor Michael Bloomberg last year." "A Vermont House committee voted Wednesday to advance legislation calling for a penny-an-ounce tax on sugar-sweetened beverages. "The House Health Care Committee voted 7-2, with two members absent, for the tax bill that would raise an estimated $27 million to support state health programs. Supporters say it will also discourage consumption of products that are big contributors to obesity.
" 'We have an obesity epidemic and the scientific data is clear that sugar-sweetened beverages have a unique place in contributing to this epidemic,' said Rep. George Till, D-Jericho, a doctor and member of the Health Care Committee." Food companies have known for decades that salt, sugar and fat are not good for us in the quantities Americans consume them. But every year, people are swayed to ingest about twice the recommended amount of salt and fat -- and an estimated 70 pounds of sugar. We speak with New York Times reporter Michael Moss about how in his new book, "Salt Sugar Fat: How the Food Giants Hooked Us." In a multi-year investigation, Moss explores deep inside the laboratories where food scientists calculate the "bliss point" of sugary drinks or the "mouth feel" of fat, and use advanced technology to make it irresistible and addictive. As a result of this $1 trillion-a-year industry, one-in-three adults, and one-in-five children, are now clinically obese. "... research suggests this artificial sweetener (aspartame) may be implicated in health risks ranging from cancer to seizures and even death." The growing attention Americans are paying to what they put into their mouths has touched off a new scramble by the processed-food companies to address health concerns. Pressed by the Obama administration and consumers, Kraft, Nestle, Pepsi, Campbell and General Mills, among others, have begun to trim the loads of salt, sugar and fat in many products. And with consumer advocates pushing for more government intervention, Coca-Cola made headlines in January by releasing ads that promoted its bottled water and low-calorie drinks as a way to counter obesity. Predictably, the ads drew a new volley of scorn from critics who pointed to the company's continuing drive to sell sugary Coke. One of the other executives I spoke with at length was Jeffrey Dunn, who, in 2001, at age 44, was directing more than half of Coca-Cola's $20 billion in annual sales as president and chief operating officer in both North and South America. In an effort to control as much market share as possible, Coke extended its aggressive marketing to especially poor or vulnerable areas of the U.S., like New Orleans — where people were drinking twice as much Coke as the national average — or Rome, Ga., where the per capita intake was nearly three Cokes a day. In Coke's headquarters in Atlanta, the biggest consumers were referred to as "heavy users." "The other model we use was called 'drinks and drinkers,' " Dunn said. "How many drinkers do I have? And how many drinks do they drink? If you lost one of those heavy users, if somebody just decided to stop drinking Coke, how many drinkers would you have to get, at low velocity, to make up for that heavy user? The answer is a lot. It's more efficient to get my existing users to drink more." In his capacity, Dunn was making frequent trips to Brazil, where the company had recently begun a push to increase consumption of Coke among the many Brazilians living in favelas. The company's strategy was to repackage Coke into smaller, more affordable 6.7-ounce bottles, just 20 cents each. Coke was not alone in seeing Brazil as a potential boon; Nestle began deploying battalions of women to travel poor neighborhoods, hawking American-style processed foods door to door. But Coke was Dunn's concern, and on one trip, as he walked through one of the impoverished areas, he had an epiphany. "A voice in my head says, 'These people need a lot of things, but they don't need a Coke.' I almost threw up." Dunn returned to Atlanta, determined to make some changes. He didn't want to abandon the soda business, but he did want to try to steer the company into a more healthful mode, and one of the things he pushed for was to stop marketing Coke in public schools. The independent companies that bottled Coke viewed his plans as reactionary. A director of one bottler wrote a letter to Coke's chief executive and board asking for Dunn's head. "He said what I had done was the worst thing he had seen in 50 years in the business," Dunn said. "Just to placate these crazy leftist school districts who were trying to keep people from having their Coke. He said I was an embarrassment to the company, and I should be fired." In February 2004, he was. Dunn told me that talking about Coke's business today was by no means easy and, because he continues to work in the food business, not without risk. "You really don't want them mad at you," he said. "And I don't mean that, like, I'm going to end up at the bottom of the bay. But they don't have a sense of humor when it comes to this stuff. They're a very, very aggressive company." When I met with Dunn, he told me not just about his years at Coke but also about his new marketing venture. In April 2010, he met with three executives from Madison Dearborn Partners, a private-equity firm based in Chicago with a wide-ranging portfolio of investments. They recently hired Dunn to run one of their newest acquisitions — a food producer in the San Joaquin Valley. As they sat in the hotel's meeting room, the men listened to Dunn's marketing pitch. He talked about giving the product a personality that was bold and irreverent, conveying the idea that this was the ultimate snack food. He went into detail on how he would target a special segment of the 146 million Americans who are regular snackers — mothers, children, young professionals — people, he said, who "keep their snacking ritual fresh by trying a new food product when it catches their attention." He explained how he would deploy strategic storytelling in the ad campaign for this snack, using a key phrase that had been developed with much calculation: "Eat 'Em Like Junk Food." After 45 minutes, Dunn clicked off the last slide and thanked the men for coming. Madison's portfolio contained the largest Burger King franchise in the world, the Ruth's Chris Steak House chain and a processed-food maker called AdvancePierre whose lineup includes the Jamwich, a peanut-butter-and-jelly contrivance that comes frozen, crustless and embedded with four kinds of sugars. "We act like a snack, not a vegetable," he told the investors. "We exploit the rules of junk food to fuel the baby-carrot conversation. We are pro-junk-food behavior but anti-junk-food establishment." The investors were thinking only about sales. They had already bought one of the two biggest farm producers of baby carrots in the country, and they'd hired Dunn to run the whole operation. Now, after his pitch, they were relieved. Dunn had figured out that using the industry's own marketing ploys would work better than anything else. He drew from the bag of tricks that he mastered in his 20 years at Coca-Cola, where he learned one of the most critical rules in processed food: The selling of food matters as much as the food itself. Later, describing his new line of work, Dunn told me he was doing penance for his Coca-Cola years. "I'm paying my karmic debt," he said. This article is adapted from "Salt Sugar Fat: How the Food Giants Hooked Us ," which will be published by Random House this month. "Why? Because the company's lawyers are taking the Northern Territory Government to court for introducing a proven and popular 'Cash for Containers' recycling scheme (also known as the Container Deposit Scheme). No, you didn't misread it: Coca-Cola is taking the NT Government to court for trying to improve its recycling system. "Together we can build the pressure on Coca-Cola Australia and stop the company from trashing Australia..."
Mission: To convince Australian state and national governments to adopt a modern, efficient national container deposit system, to stop billions of beverage containers from going to landfill and litter each year. Company Overview: The Boomerang Alliance represents 23 national and state-based environment groups and local government organizations across Australia, concerned about packaging and waste. "A New Zealand coroner has linked the death of a 31-year-old woman to her Coca-Cola addiction. "Natasha Harris died Feb. 25, 2010 from a cardiac arrhythmia, according to a 19-page coroner's report obtained by ABCNews.com. And while Harris, a mother of eight from Invercargill, New Zealand, was known to smoke heavily and skip multiple meals, coroner David Crerar concluded that the sugar and caffeine she got by drinking more than 2.6 gallons of Coca-Cola Classic per day was 'a substantial factor" in her death.' 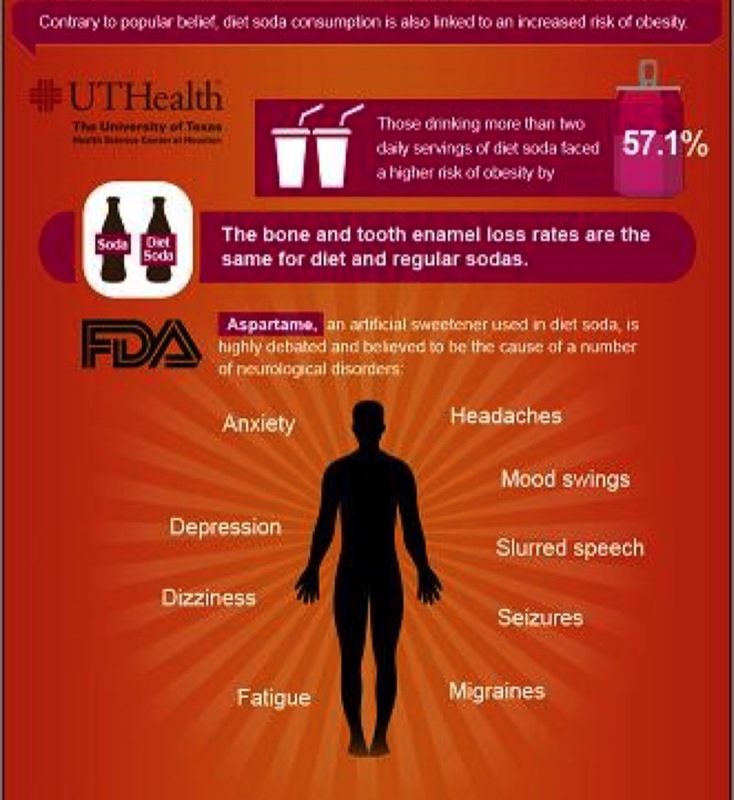 "
"Yet another study confirms what people have been saying for ages: Stop drinking diet soda. Like, right now. Drinking just one 12-ounce can of an artificially sweetened fizzy drink per week can increase your risk of Type 2 diabetes by 33 percent, French researchers found. And given that most people don't stop at a single weekly serving, your real risk for diabetes could actually be much higher." Following is the film in French. We will soon post the film with English translation. "...After all, using the word "vitamin" in front of the name [Vitamin Water] surely implies that there is some nutritional or healthy value. It must be good for you, right? Wrong! These drinks hold about as much nutrition as that piece of lint in your pocket. "In retaliation for this misinformation, the non-profit Center for Science in the Public Interest, is suing Coca-Cola (Coke bought Vitamin Water for over $4 billion in 2007) on the grounds that vitaminwater labels and advertising are filled with "deceptive and unsubstantiated health claims." vitaminwater contains about 33 grams of sugar, while Two Hostess Ding Dong cake snacks have about 36 grams of sugar. Instead of taking the silent plea here Coke attorneys are defending the lawsuit by stating that 'no consumer could reasonably be misled into thinking vitamin water was a healthy beverage.' What!?" "What wasn't mentioned in the AP report is the close ties between the NAACP and Hispanic Federation and the liquid candy industry. "The Center's executive director, Michael Jacobson, told Corporate Crime Reporter that 'it is sad that disease-promoting companies can influence civic groups by giving them donations.'" "There is virtual consensus that drinking too much soda is bad for you, and it's not hard to understand the evidence. I asked Rob Lustig, a pediatric endocrinologist at the University of California, San Francisco, and the author of 'Fat Chance: Beating the Odds Against Sugar, Processed Food, Obesity, and Disease,' if he'd sum it up for me. His response: 'A calorie is NOT a calorie. Different calories have different metabolic fates in the body. Those from fructose overwhelm the liver, forcing the pancreas to make more insulin and driving more energy into fat cells. And soda is nothing but a fructose delivery system.' 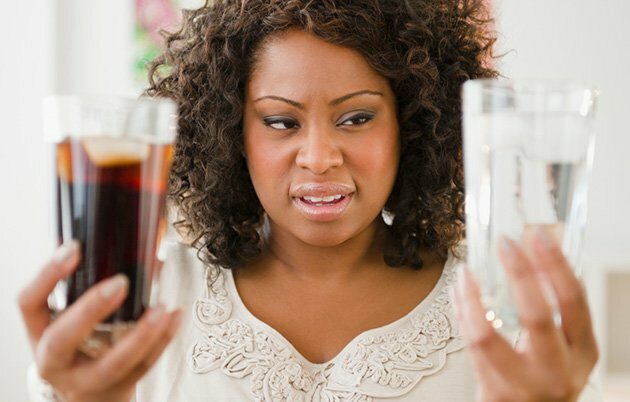 "
"Soda is a fructose delivery system as tobacco is a nicotine delivery system. (And if it's not 'truly' addictive but only habit forming, so much the better; it'll be that much easier to get people to cut back.) That's why added sugar, especially in liquid form, is rapidly becoming the focus of savvy public health officials, scientists, physicians, journalists, parents and even politicians. And the ridiculous notion that government has no role in public health - the blind 'nanny-statism' argument, which ignores everything from seat belts to tobacco to guns - is being overwhelmed by the tide of evidence, as demonstrated by a recent poll by The New England Journal of Medicine, in which 68 percent of nearly 1,300 respondents worldwide 'favored government regulation of sugar-sweetened beverages.' "
"There's a way to make the mayor's [NYC Mayor Bloomberg] lead even more effective: Stop purchasing products created by Coca-Cola until the company can be honest about what modern nutritional science is telling us. And yes, that includes putting down the Dasani and installing a filter onto your faucet." "Say It Ain't So — A Can of Soda a Day Can Increase the Risk of Cancer for Men by 40 Percent? "A new medical study poses huge questions for the future of soft drinks." This week the Coca-Cola Company confessed it — possibly — has a problem with sugar, as the first stage of being 'part of the conversation' about . OK, Coke, this is what we've been talking about. "At the same time Coca-Cola is boasting about its smaller cans and diet offerings, it's fighting tooth-and-nail for the right to sell drinks in giant, calorie-packed servings." "The beverage corporation has allegedly pulled all of its advertising from the state-owned France Televisions following a controversial documentary that aired on France 2, according to reports. 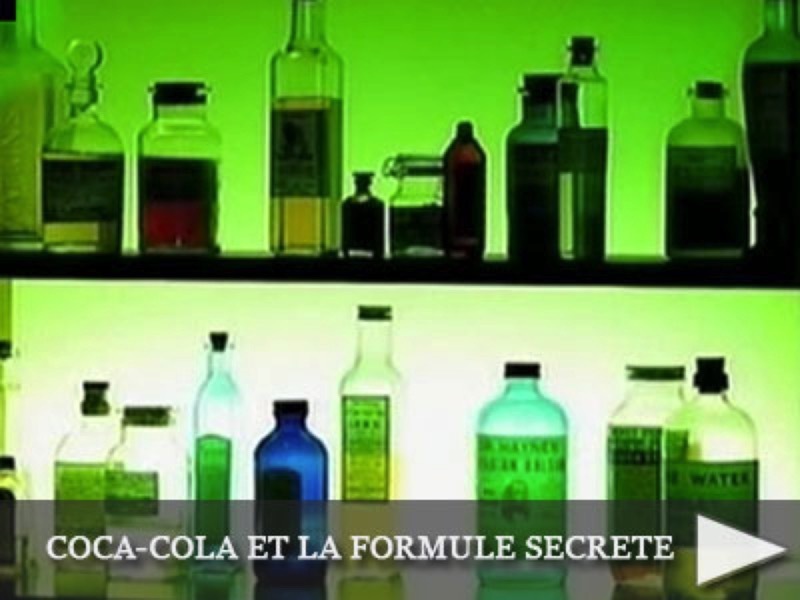 Coca-Cola et la formule secrete apparently rubbed executives the wrong way, because its 'troublemaker' host posed questions about the safety of the soda directly to the company's chief executive in front of shareholders." Coca-Cola is one of the best known product names in the world, and the Coca-Cola Company has long been the leader of the international soft drink industry. Once preoccupied with its perennial market-share battle with PepsiCo, the company has had to cope with declining consumption of carbonated beverages, prompting it to branch out into juices, sports drinks and bottled water. While it has long cultivated a benign image, Coca-Cola has also been confronted with international pressure campaigns on issues ranging from labor practices in Colombia to water use in India. In the United States, the company has faced charges of racial discrimination, accusations that its marketing efforts contributed to the national problem and criticism over the environmental impact of its move into the bottled water business.